Santa Claus has long been the symbol of Christmas, bringing joy and presents to all the good girls and boys. But if you are child in Germany, Austria, and other parts of the Alps region, there may be something much more dark, mischievous, and grumpy hidden in the shadows next to dear old St. Nick. That something is Krampus, the Christmas demon. A beast-like creature with fangs, fur, and horns, Krampus announces his presence with loud bells and terrorizes the kids who have been naughty during the year. While Santa gives the good ones gifts and joy, Krampus gives the bad ones beatings with a whip (made from birch sticks and horsehair) and nightmares. 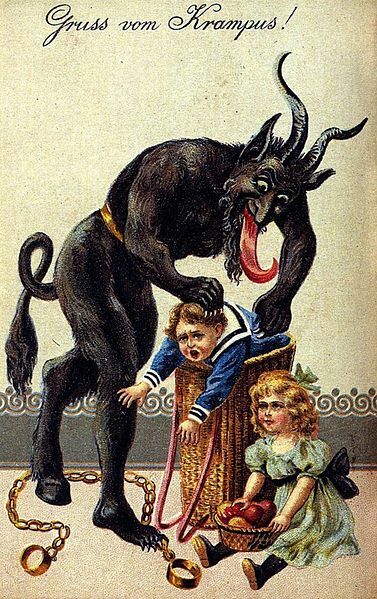 As for the really, really naughty kids, Krampus drops them in a sack (or a wicker basket on his back) and whisks them away to his lair – which is of course the underworld – never to be seen again. So how did this mythological beast come to be a part of this region’s Christmas tradition? High up in the Alp countries of Europe is where Krampus was born, or, more accurately, where the legend was created. The word “Krampus” is derived from the Old High German word krampen, meaning “claw.” According to Norse mythology, Krampus is the son of Hel, the goddess ruler of the underworld. There are also a few physical similarities between Krampus and Greek mythical creatures – like the horns and hoofs of satyrs and fauns. Scholars estimate that Krampus started appearing around the 13th century, if not earlier – perhaps in the 11th century. Originating in Southern Germany and Austria (the area known as Bavaria), the creature moved to other European countries such as Switzerland, Czech Republic, Hungary, and even the Alp villages of Italy, sometimes with variations on the name and practiced customs. For example, in Tyrol (a state in western Austria), Krampus tends to look like a giant, sadistic, teddy bear. In western Germany, he actually arrives with Santa, sitting shotgun in his sleigh. In Styria (southeast Austria), the birch sticks used for his whip are painted gold and displayed year around, to remind kids of Krampus’s impending arrival. As Christianity took over the region, Krampus wasn’t forgotten, but rather altered to match changing customs. No longer thought of as a pagan tradition, he was given chains, to show the “devil” being binded by the Church. Soon, Krampus was attached to St. Nick, a Christian saint and the owner of his very own feast day (or celebration) on December 6th. St. Nick, himself, wouldn’t be closely associated with Christmas until early 19th century with the name Santa Claus coming from the Dutch of the protracted words for St. Nicholas. In many parts of Germany and Austria, St. Nick is still separate from Christmas and celebrated on December 6th. To further the connection between the two, Krampus was awarded his own night on December 5th, the day before St. Nick’s feast (the same evening when kids would put a boot outside, hoping St. Nick drops fruit and nuts into it). Called Krampusnacht (Krampus Night), Krampus bounds around making loud noises and scaring kids. This night is still celebrated in the Alps region with it being customary to offer Krampus a drink of warm schnapps. Despite these attachments to Christianity, some pagan traditions have survived and are still part of today’s Krampus. To wit, he continues to carry bells, which were customarily used to ward off spirits. As mentioned, the animal-like appearance of most Krampus’ also date to pagan times. Krampus, along with other German pagan legends, started to regain acceptance and a following in the 19th century. This was partially due to the ancient German folk tales that the Brothers Grimm popularized in the early 1800s. In fact, Krampus gets a quick reference in Jacob Grimm’s 1835 book Deutsche Mythologie (translated to “Teutonic Mythology”). Art and postcards were also created that showed off Krampus and people began to exchange Krampus cards (with some saying “Greetings from the Krampus”) in Europe during the late 19th century as a rather peculiar way of saying “happy holidays.” They tended to be kitschy in nature, even with somewhat sexual overtones such as a Krampus scaring a good-looking, half-dressed woman. Krampus hasn’t always been an accepted European tradition. In 1934, four years before the Third Reich overran Germany and Austria, The New York Times ran an article with the headline, “Krampus Disliked in Fascist Austria; Gienel Black and Red Devil, Symbol of Christmas Fun, Is Frowned Upon.” The article goes on to say how the Austrian Fascist government outlawed Krampus, even going so far as claiming he was socialist. When the fascist government fell after World War II, Krampus was allowed to walk the streets once again. More recently, Krampus has started his rise in popularity in America, with Krampus festivals across the country, including ones in Los Angeles, Philadelphia, and New York City. Other lesser known holiday figures include northern Germany’s Knecht Ruprecht, who carries a bag of ashes and beats kids with it who don’t know how to pray properly. Or, more notoriously, Zwarte Peter, translated to “Black Peter.” Zwarte Peter is St. Nick’s trusty companion whose job it is to amuse the children and give out candy.